The new year has brought with it chilly temperatures and new ambitions. As you consider your resolutions, does protecting your home make it on to the list? Whether you’re a new homeowner or just revisiting the needs of your established home, termite control is not something to take lightly. Unfortunately for homeowners, we live in a region where termite activity is inevitable. Although warm weather and lots of rain can create the most ideal environment for termites to thrive, they stick around during cold seasons as well. That’s why we have created a winter campaign to educate our customers and potential customers about the threats that termites pose to your home. Mud tunnels. Termites build mud tubes to use while traveling between the colony and food sources. The tunnels are used to provide them with moisture on these journeys. Damaged wood. Termites feast on wood from the inside so if wood sounds hollow when tapped on, that could be a bad sign. You may also see blistering wood in damaged areas. Keep an eye on door frames and window frame areas for this damage. Damaged paint. If paint appears to be bubbling, it could be a sign of moisture, water damage, or termite damage. Controlling moisture levels. Termites need moisture to thrive, so keeping the moisture level in your crawl space, attic, and basement under control can reduce the chances of termites setting up shop there. A pest control professional can perform a moisture reading and install a moisture barrier if needed. Repairing any leaking faucets or faulty pipes. Pipes or faucets in need of repair can contribute to moisture issues, so repairing leaks in a timely manner can help you avoid a disastrous situation, both from water damage and termite damage. Storing firewood away from the foundation of your home. 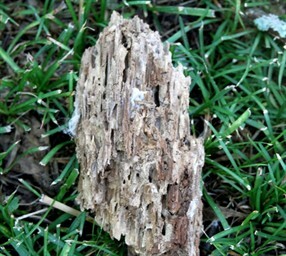 A stack of firewood sitting on the ground directly next to your home’s foundation is a termite’s paradise. Keep them away from your house by storing firewood 20 feet or more away and ideally keep it elevated so that it does not sit directly on the ground. Keeping mulch away from the foundation of your home. Mulch may look pretty and add to your home’s landscaping, but at what cost? Create a barrier between the foundation and any mulch surrounding the home to keep termites from using the mulch as a convenient highway into your home’s structural foundation. Call American Pest Control this winter to schedule a free termite inspection and take advantage of the Sentricon special!